Today is a very special day, not only is it a day I should have not come into work. 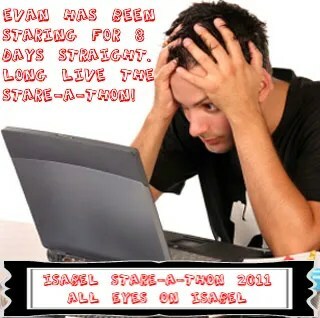 But, also the 10th day of the stare-a-thon! I would like to take this time to thank Starers for joining in the most wonderful time of the year! Also to celebrate their thoroughness in staring… like taking time off of work to stare, adding the stare-a-thon app to your personal internetting devices, buying a good sturdy periscope, and lurking about Isabel in the shadows as to not interfere with her schedule. BTW. Tomorrow Starts the Professional Quote of the Day Holiday Edition. < Anger in the Afternoon.